Melbourne, Victoria. Views of Vienna at the NGV. Scones***3stars | Sconquest. Art is a matter of taste. A smorgasbord of likes and dislikes with a dazzling array of choices. Few of us have the space for these larger than life portraits by Gustav Klimt but they were my favourites. Bright, colourful and captivating with no intention of being ignored. 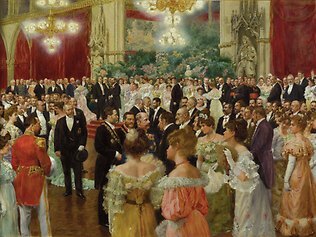 Klimt painted them between 1902 and 1906 at much the same time as Wilhelm Gause painted the Mayoral Ball below. Josef Hoffman’s designs made everyday objects into works of art but weren’t necessarily practical or comfortable. At the end of the exhibition was an astonishing child’s desk carved with all manner of whimsical motifs but unfortunately there was no postcard of it for sale and I can’t find the makers name, maybe Anst?. Wonderful to be able to download the Audio guide or NGV app straight from itunes for your ipod or iphone. A pleasant wander round the Deep Water Photograph and Manstyle exhibitions then onto the Tea Room on Level 1 to try out their scones ($9.50). It was a bit early for a high tea and its for 2 people ($70-$90). The Tea Room is in a cosy corner of the gallery above the main doors and is very popular. Here’s the food and drinks menus.The scones were curiously dry on the outside like a macaroon and a bit crumbly so they fell apart. Perhaps the yummy looking cakes in the display would have been a better choice. This entry was posted in Attractions, Exhibitions, Gallery, Melbourne, Scones, Victoria and tagged app, art design, itunes, melbourne, ngv, tea room, vienna. Bookmark the permalink.